SS. I realise that a black hole is not a hole of the sort you might dig in the ground. The question about a black hole being a hole in something arose because I was asking the question as a part of an ongoing thought train linked to the idea that if the entire universe were contained in the “singularity”, and if that were surrounded by a gravitational field, where would the field be? On the other hand, if the gravitational field is part of the universe, how could the entire universe be within the singularity? I suspect that what we need is an expert to tell us what the standard version definitions are for black holes and singularities, so that we have a solid scientific base for our discussion. I have a feeling, though, that that might not be straightforward. I have some difficulty with the concept of a singularity, which links directly to my thoughts about infinity. The frequently encountered definition of a singularity involves spacetime being infinitely curved. It would be absurd to suggest that anything finite could actually become infinite, so one can only assume that we are dealing with a mathematical infinity which is an approximation. If this applies to black holes, does it also apply to the Big Bang singularity? If the infinite curvature of the BB singularity is just an approximation, then there is a finite amount of matter/energy present at the BB. This seems to fit well with your idea. On the other hand, if we are really being told that at the BB spacetime is infinitely curved, this raises all kinds of questions. At least, it does for me. If spacetime is infinitely curved, then the amount of matter/energy it contains must be infinitely small. What does infinitely small mean? Can we distinguish between infinitely small and non-existent? If infinitely small means non-existent, then there was absolutely nothing at the BB, but something after it. Where did the something come from? Is that a bit like asking difficult questions about God in a catechism class/Sunday school, where asking such things equates to lack of faith? The floodgates of questions are gradually opening, but modestia in omnibus. I see were your coming from, and why you think that. To start off the matter contained inside a black hole is not "infinity small" But it's pretty darn close which is why people tend to think that the singularity is infinitely small. when the black hole condenses matter into being 0% empty space it can take the mass of an entire star and condense it into being microscopic, scratch that, it can condense a star into being the size of one atom now that's saying something. When mathematicians calculate the curvature of space of a black hole they see that it correlates to the near infinitely compressed matter within a black hole. the matter inside a black hole is "almost" infinitely compressed and the curvature of space is "almost" infinitely compressed. I mean to say that it's so freaking compressed that it seems infinite. the math is so close to reading that it's infinitely compressed that they assume it is. and because the curvature of space directly correlates to the condenseness of matter that too appears to be infinity curved. I hope this makes sense. because the curvature of space directly correlates to the condenseness of matter that too appears to be infinity curved. I hope this makes sense. It makes perfect sense to me. Its what I have been saying in different ways, in different threads for a long time. Mathematical infinities are approximations. They have their value, in the right place, but suggesting that they are actually infinite causes confusion, because, as in the case under discussion, the conclusions are completely different. It seems that in your scenario all the matter/energy from the "retiring" universe survives the bounce, so each universe is recycled. Is that right? Yes, exactly right! Even the light form the far edges of the universe will be recycled, Because gravity will still pull on that light (even if that that pull is so weak you can't measure it) The force of gravity never actually disappears, it just gets weaker with distance, I believe that light is in a huge orbit around the universe with "stuff in it" (I like to call the area of the universe with "stuff in it" the "finite universe") It's a bit like how planets orbit the sun but the force of gravity at that distance is really weak, the same is true with the orbit of light around the finite universe the only difference is that the force of gravity acts on light very very very weakly but it still acts on it at any distance so light must orbit the finite universe and eventually be pulled into the singularity at the end of this universal cycle. "that will take a very long time" and be one of the last things that will happen before the second big bang. Only when every last bit of the old universe (including light) is contained in the singularity will it implode, this is partly do to the uncertainty principle and partly do to the singularity reaching critical mass. You have lost me with the bit about light orbiting the “finite universe”. Does your scenario not have light permeating the Universe? You refer to the universe with "stuff in it" as the "finite universe". Is the orbiting light entirely outside that? Is there an infinite universe? Returning to the idea that everything survives the bounce, I assume this includes time. Am I right in thinking that time is continuous through a succession of universes, rather than being created at the start of each universe? Ok there are 2 parts to the universe, the finite universe (with stuff in it) and the fabric of space which represents the infinite universe. The finite universe represents the area of space with matter and light in it (stuff). I posted what I thought of the finite universe a wile back on this thread. It works like this. All the light and matter of the universe was contained in a single spot before the big bang, after the BB happened, it sent matter and light shooting off in all directions. So logically speaking the finite universe is only as big as the light traveled in all directions from the singularity at the moment of the BB. If the big bang happened 13.8 billion years ago then light could have only traveled 13.8 billion light years in all directions, so that represents the radius of the finite universe, the diameter is 2 times the radius so the finite universe is a sphere 27.6 billion light years in diameter and growing at nearly the speed of light, THAT IS THE FINITE UNIVERSE the area of the finite universe with matter in it is much smaller then the area of space with just light in it, because light travels much faster then matter. The area of the finite universe with matter in it is the only part of the universe with gravity. Like I was saying gravity never actually disappears, it just get's weaker with distance, so no matter how far away you are from the source of gravity, gravity still acts on you even if that force is incredibly weak. Gravity acts on light, just very weakly I know this to be true because light gets pulled into a black hole via the force of gravity there-fore gravity acts on light. so even on the far edges of the finite universe (which is only occupied by light) gravity still acts on that light just super weakly, over the coarse of billions of years light will be curved a fraction of a degree until eventually it gets bent enough to find its orbit around the finite universe. I hope that clarified what I meant when I said the "finite universe" and "light orbit", This concept is not exactly simple so I understand why you were confused, I should have described that bit in more detail. If you still have questions concerning this concept feel free to ask. This diagram represents the finite universe. 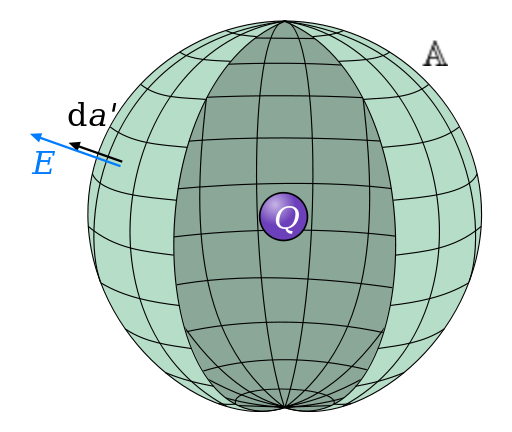 Q represents the area of the finite universe with matter and light in it. A represents the area of the finite universe with "just" light in it and E represents the rate at which the "A" is expanding. Right now the diameter of A is 27.6 billion light years across and expanding at the rate of E which is the "nearly" speed of light, it will slow down as light is curved over billions of years untill it stops and light finds it's orbit. Thanks SS, that makes the picture clearer. Not being one who has any facility worth mentioning in maths, it will take me a while to mull over the bits about the size of the Universe, but I feel sure there will be questions. So far, I have this mental image: The inner “sanctum” is the universe with matter. This is expanding into the universe with only light, which, in turn, is expanding into the infinite universe. The universe with light is expanding faster than the universe with matter, so the latter will never catch up with, or fill the former. Am I on the right track so far? BTW, I hope you don't mind my referring to you as "SS"; it's pure laziness, so I can stop if it offends you. It sounds like you get the gist of what I'm talking about. But I wonder if you got the part about "light orbit" around Q (the inner sanctum) the force of gravity will pull on the light on the outer edges of A (the part of the finite universe with only light in it) The pull will be very weak but will eventually cause light to orbit Q This orbit will be super gigantic because light is barley effected by gravity. At that point light will spiral inward slowly and eventually get sucked into the singularity. In much the same way planets orbit the sun and will eventually get sucked into it. When this happens the finite universe will stop expanding and begin to shrink. The same is true for Q Which will eventually become the singularity. all the matter in the Q will become a super black hole. then billions of years will pass before the light on the outer edges of A will be pulled in too. when the singularity pulls in every last photon then it will implode into another big bang. Seems legit, a brilliant theory sorcerer! But what do you call this theory of yours? I know it shares many parallels with the big crunch theory but you describe it in so much more detail you even account for dark energy and in the process you may have actually figured out what dark energy is! Incredible! I know it's not my place to name your theory but might I suggest the universal atom theory? Because according to you the universe is like one big atom, and instead of an electron cloud the universe has a photon cloud. I was thinking about your theory a little and I was wondering something, you leave out "dark matter" from your theory, I'm curious to hear what you think dark matter is. you've convinced me that dark energy is in fact gravity waves. well what's dark matter? I get the bit about the "light orbit" around Q. What I am not clear about is the relationship between the finite universe and the infinite universe. Is the infinite universe a permanent fixture? Does it provide space and/or time through which the finite universe travels? Because you have light and matter travelling at different speeds, I assume they are travelling through something rather than being carried along by expanding spacetime. Is that a right impression? The fabric of space is endowed with properties which are quite mysterious, I can't honestly say that I know what it is or how old it is. The only thing I know is that the finite universe Is a sphere which exists in the infinite universe, I can only assume that Both aspects of the universe are infinite (in time) while only one aspect is (infinite in size) time and gravity are not direct properties of the fabric of space, it's the result of the interaction between the finite universe and the infinite universe. Imagine the fabric of space without matter or light (energy) gravity wouldn't exist and time would be meaningless because nothing would change. Now imagine matter and light without the fabric of space to move through, gravity wouldn't exist and time would be meaningless because nothing would change. So you see time and gravity is the result of the relationship between these 2 aspects of the cosmos. So To clarify the relationship between the finite universe and the infinite universe, the interaction between the 2 parts of the universe gives rise to time and gravity. Both the finite and infinite universes are infinite (in time) and only the infinite universe is infinite (in size) so both aspects of the universe are permanent fixtures. light and matter are traveling through the fabric of space which gives you time and gravity. THAT'S WHAT TIME IS. gravity is also the result of "stuff" moving through space too you see if you accelerate matter to nearly the speed of light then they get heaver and thus get more gravity. time slows down do to the speed of the atoms. "Time is effected by how fast something is!" there fore time is a result of matter/light (finite universe) interacting with the fabric (infinite universe) so time is meaningless/nonexistent outside the area of the point the finite universe stops and light finds it's largest orbit. beyond that point nothing ever changes because the finite universe never interacts with the infinite universe at that point. so what happens when you have the fabric of space and it docent interact with matter/light? Gravity wouldn't exist and time would be meaningless/wouldn't exist because nothing would change. I think I am going to have to chop this into bite sized chunks. Yes, when I say infinite space, I'm referring to the fabric of space/time……..But beyond the limits of the finite universe there is nothing…. I must be misunderstanding this bit. You seem to be saying that the infinite universe is composed of “the fabric of space/time”, but beyond the finite universe there is nothing. How can this be if the infinite universe is composed of space/time? Oh sorry my bad. You caught my bad wording :-) when i said nothing is beyond that point, I ment nothing BUT empty space and no time. Because at that distance the infinite universe dosent interact with the finite universe time dosent exist because nothing ever happens in that area of space, matter and light dont ever come into contact with the fabric that far out, so time is meaningless / dosent exist because nothing ever changes, nothing will ever happen to it at that point. Just empty space for infinity. It sounds similar to that statement i think you came up with near the begining of this thread about the bridge and roads going off for infinity on both sides of the bridge. Just imagine the bridge being the finite universe and infinity going off in both directions. So in a sence space is just space not ''space time'' time is the result of the interaction between the finite universe and space. Thanks SS, that clarifies that bit. Am I right in thinking that the extent of the interaction between finite and infinite universes would be the spherical surface between the advancing light and the infinite space? The only thing I know is that the finite universe Is a sphere which exists in the infinite universe, I can only assume that Both aspects of the universe are infinite (in time) while only one aspect is (infinite in size) time and gravity are not direct properties of the fabric of space, it's the result of the interaction between the finite universe and the infinite universe. You may have noticed in other threads that I tend to use the term “cosmos” as roughly equivalent to your “infinite universe”. If I do that here please don’t think this is an attempt to “improve” your terminology. It is very difficult to talk about infinity/eternity without using terminology that is rooted in linear time and 3D space. Thus we talk of infinite time, or infinite space. However, infinity/eternity must be timeless and spaceless. A second is finite, and nothing finite can become infinite. A cubic metre is finite, so the same applies. Anything that is infinite must always have been infinite, and must always be infinite. I need to check your view of this before trying to go any further, just to avoid getting crossed wires. Consider a situation where a big bang occurs and the resulting universe is expanding exactly like the balloon analogy. When neighbouring bubbles collide gravity will cause a new big bang singularity if enough mass is compressed and the whole thing starts again. In this view light does not need to orbit the bubble but could in fact be pushing its surface outward. The image below shows four adjacent expanding bubble universes. Think of it like wave interference. BTW you only need 1/4 of the mass of each bubble to meet and compress to reproduce a singularity equal to 1 original universe. Of course this is idealized and mass/bubble sizes would vary as would their relative positions. you said "nothing finite can become infinite" this is true, But there is only one thing that is infinite in the "cosmos" and that's the fabric of space. It's infinity in it's most pure form and we live in it, it surrounds us and we get a pretty good view of it from earth. now when finite things interact with the infinity you get something that is in-between time and gravity are like electro and magnetism two sides to the same coin of infinity. there are only 3 things that exist in the cosmos. energy, matter and space these are the characteristics of each. these three things interact with each-other, one could not exist without the other. it's like the try-force off of that game legend of Zelda. the trinity that comprises the 3 dimensions I want to show you a picture I drew a long time ago, Its saved on my computer but I don't know how to upload pictures from my hard drive, only from urls It has to do with sacred geometry just overlap 3 circles (each circle represents one aspect of the universe) and if you draw lines through it you get the try-force. How do you upload Images fro your hard drive? I feel it is a problem with the theme I am using. I have two installs on the same server. One with a standard theme and the e-mail redirect works fine. The one using the theme Zaffatasa has the problem with the e-mail redirecting back from the contact form. I found this quote among my notes from a few years ago. It’s from one of Paul Davies’s books, but without checking I can’t say which one. However, Davies also says: “One way to sidestep this dismal conclusion is to suppose that the physical conditions at the bounce are so extreme that no information about earlier cycles can get through to the next. All preceding physical objects are destroyed, all influences annihilated. In effect, the universe is reborn entirely from scratch. SS, is this how you see it? In a Way yes, When the singularity is formed and it contains all of Q and A (the finite universe) then it will implode All matter in the universe will be converted into energy, less then a minute after the singularity collapses and explodes, matter will form out of the energy. No matter can escape this fate the big bang cycles renews the universe like a phoenix being reborn from it's ashes. I don't know what your quote meant regarding the the second law of thermodynamics and "degenerative heat"
I believe what he meant was that heat will eventually be nonexistent because it will be converted into light and escape into "A" (the outer reaches of the universe) in that case the universe will continue to cool down until space reaches near absolute zero, As energy escapes into ''A'' but that wont impede the construction of the singularity in the end. Its the force of gravity that causes the renewal of the universe not heat. This thread seems to be veering way off the mainstream physics track and into new theories. If you guys want to keep going on non-mainstream ideas regarding the fundamental forces and nature of the universe, I can move it to New Theories. If if you'd rather keep it here, I'd just ask that you keep it to mainstream ideas.